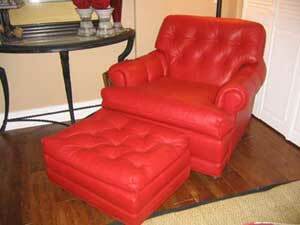 Call KJ for furniture & antique reupholstery, leather repair, window seats, cushions and orthopedic dog beds. We make custom beds and cushions for camp trailers, Sprinter & other van conversions. KJ has a wide selection of foam, cushioning options, leather, Sunbrella, green/earth-friendly fabrics and much more! Get an Estimate: To inquire about current calendar spots available, or for foam or fabric sales, call or send an email. Please note that KJ's is often booked out for 4-5 months for larger projects. 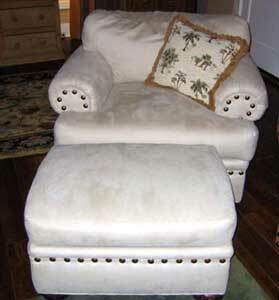 Specializing in furniture reupholstery for over 30 years. Karen Johnson, owner, uses her craftsmanship and creativity to complete your project to the highest standards of excellence. Is my furniture worth reupholstering? Good question...go here to find out. Before and After: View "before and after" photos of KJ's work. Photo Gallery: Take a look at more of KJ's completed projects. Frequently Asked Questions: Get answers to common questions about reupholstery. Furniture Construction: Learn about frames, springs, cushions, etc. Home Decorating Tips: General decorating ideas for your home.